There are, by actual count, umpteen bajillion websites that proudly recount the history of the bagel—that is to say, a lovely and plausible story that is, alas, almost certainly wrong. The story claims that bagels were invented in 1683 by an anonymous Jewish baker in Austria. King Jan Sobieski (a.k.a. King John III) of Poland had just saved Austria from a Turkish invasion, and because of his legendary equestrian skills, bread in the shape of a stirrup (or Bügel in German) was seen as an appropriate way to honor him. Well, perhaps stirrup-shaped bread was baked for Sobieski, but there’s evidence that Polish Jews were baking bagels long before that—at least as far back as 1610. 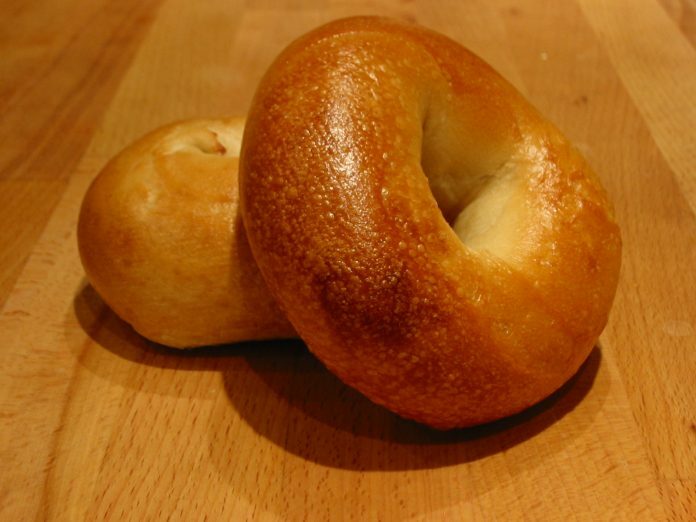 And the Polish name for the bagel, bajgiel, came from the Yiddish term beygl, which in turn derives from the Middle High German word böugel, or ring. Etymology aside, the real mystery, which no one seems to have solved, is who came up with the brilliant idea to boil bagels before baking them, which is what gives them their characteristic texture both inside and out. (Depending on who you ask, bagels should be boiled for anywhere from a few seconds to six minutes before baking; in my opinion, longer is better.) Equally mysterious is how cream cheese—and later, smoked salmon—came to be intimately associated with the bagel. In any case, bagels were popular with Jewish immigrants from Poland to the United States at least as early as the 1880s. They slowly gained popularity, until in the 1960s mass-production techniques made them available to a national audience. Unfortunately, even as bagels were becoming a household word, their very nature was changing. The sacrifices in quality and authenticity that were made in order to produce and transport vast quantities of bagels across the country meant that what people were falling in love with was a far cry from what was found in New York delis. In the last few decades, some large commercial chains have made at least a reasonable effort to offer high-quality fresh bagels, although at the same time, ersatz supermarket bagels have proliferated at a troubling rate. Buy your bagels from experts. The best place to buy bagels, of course, is a Jewish bakery, preferably one that sells only bagels. Failing that, at least make sure your bagels are freshly baked, and don’t be embarrassed to ask if they were boiled first. It matters. A lot. All things being equal, I’d trust a mom-and-pop store to get my bagels right before I’d trust a chain, but there are a few exceptions. Test your bagel for freshness. A well-made bagel is shiny and hard (but not crispy) on the outside, very soft and chewy on the inside. Squeeze the bagel lightly but firmly between your fingertips. It should squish almost all the way through. If you meet a lot of resistance, you’ve got an old bagel. Do not eat bagels that have been frozen. If your bagel was frozen, chances are it was baked considerably longer ago than 12 hours. Even if it went straight from the oven to the freezer this morning, freezing has the remarkable tendency to dry out foods. And moisture, remember, is the main thing that makes a good bagel. Do not toast your bagels. I know a lot of people disagree with me here, but think about it: your bagel has already been boiled and baked. Do you really need to cook it a third time? Well, if it’s a day or two old (or if it was frozen), then of course you need to toast it, because that softens it on the inside even as it makes the outside crunchy. But it also dries it out further, and almost completely eliminates the chewy texture. Fresh bagels not only don’t need toasting, they suffer when toasted. If you’ve gotten into the toasting habit because all you ever ate were frozen bagels, see what a really fresh one tastes like without. You probably won’t want to go back. Adorn your bagel lovingly with cream cheese. Or don’t. Toppings are a personal matter, and with all these other rules to remember I don’t want to burden you further. But please consider: a bagel is not merely a vehicle for transporting cream cheese into your mouth. Too much of any topping and you miss experiencing the True Bagel Essence. The first time I ever saw a bagel, it was covered with lacquer and had a magnet on the back. I couldn’t comprehend what made it any different from a donut, and when I heard that it wasn’t sweet, I thought, “Well, what’s the point then?” A few years later I tried a toasted frozen bagel and thought it was OK, but not particularly memorable. But eventually I found out what real bagels were supposed to taste like, and after that it was very hard to accept anything less. When I was living in Texas in the early 1990s, a nearby supermarket sold something they called “bagels” that were actually dinner rolls with holes in the middle. I was mortified to think that this is what the local residents thought bagels were really like. On a trip to New York in 2000, Morgen and I made a pilgrimage to H&H Bagels, considered by many at the time to be the world’s finest bagel bakery. I had a fresh, warm blueberry bagel—no cream cheese, no nothing—and my mouth was happy all day. So I, like thousands of other bagel lovers, was very sad to hear that H&H went out of business in 2012 after one of the founders was convicted of grand larceny for stealing hundreds of thousands of dollars from employees’ paychecks and failing to pay a considerable amount of taxes. The loss of H&H left a real hole in the community. But there’s another company, called H&H Midtown Bagels East, that was opened by the original founders of H&H back in 1974 and has been run by other owners since 1979. It has two Manhattan locations, at which you can buy bagels that are at least similar to the H&H bagels of years past. And yes, they can deliver bagels overnight via FedEx—if you have enough dough. Note: This is an updated version of an article that originally appeared on Interesting Thing of the Day on August 1, 2003, and again in a slightly revised form on August 6, 2004.